Members of the Child and Youth Advisory Council (CAYAC), Family Advisory Council (FAC), and the Youth Transition Patient and Family Advisory Council (TAC) completed a survey on their experience as patient and family advisors. 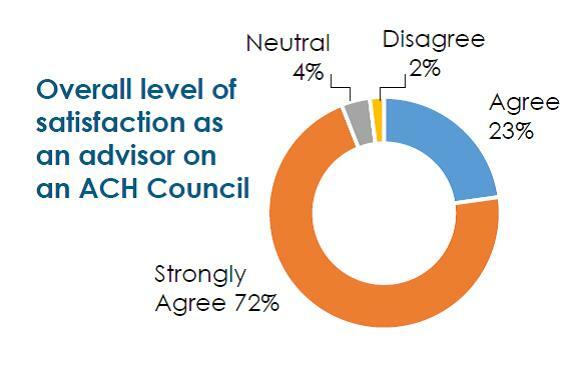 71% of members of the ACH advisory councils responded. The Council advisors indicated a strong level of satisfaction with their involvement with the advisory councils. Members felt that their work impacted not only AHS, but Albertans as a whole. One survey respondent stated that the Council's work "impact[s] AHS for the better - bringing about real people with real stories and hearing what they need or want as people using the services." Additionally, council members reflected on the personal impact of engaging through ACH. "My experience has really helped me to be more understanding and open-minded towards people with all sorts of disabilities or medical conditions," stated one TAC Survey Respondent. The survey identified future areas of focus to strengthen patient and family council member engagement. These included developing council member skill sets, increasing the opportunities for the council to provide more regular feedback, and improving the diversity of overall membership. Click here to view the summary infographic. 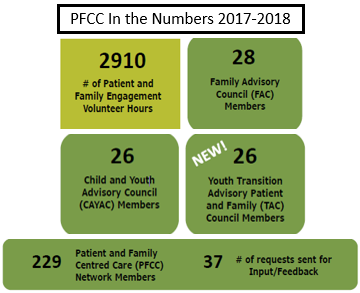 Our year end numbers (April 2017-March 2018) are in for Patient and Family Engagement at ACH! Our patient and family advisors contributed 2910 hours. Over the year, they responded to 37 requests for input/feedback via email. Our advisors filled 80 positions on Councils and Committees. The new hospitality role included four volunteers who distributed 222 family guides. Peer mentors completed 203 Bedside Connections visits and started 35 new one-to-one connections. As summer comes to an end, getting organized for fall starts to cross people's minds. One way patients and famlies can get organized is by using the Family Journal, a resource available through the Family & Community Resource Centre. The Family Health Journal is a binder that helps families and youth keep track of important health information whether its preparing for appointments, tracking clinic visits, recording key contact info, and much more. It can also be passed down to youth when they get older to empower them to take more responsibility for their healthcare as they transition to adult care. 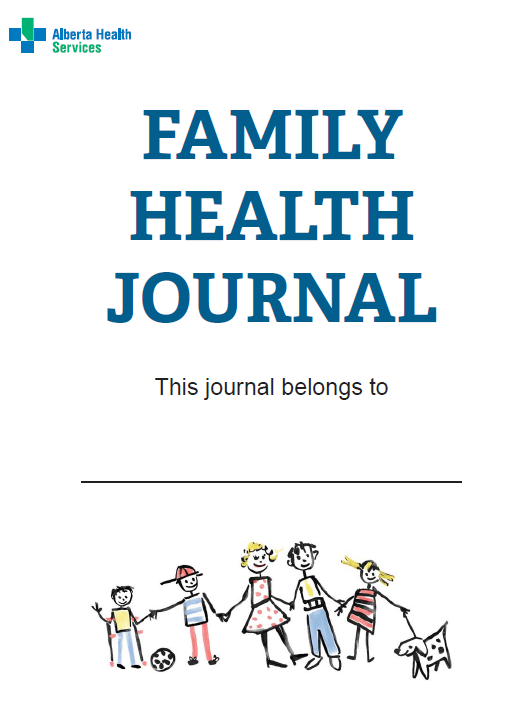 The Family Health Journal is available from the Family and Community Resource Centre or digitally through the FCRC website. The Patient Experience Journal (PXJ) published a special issue (Volume 5 Issue 2) focused on the patient and family experience in Children's Hospital and Pediatric Care. The journal features a broad range of global pediatric organizations and institutions. Click here to access this special issue of PXJ. The Canadian Family Advisory Network (CFAN) is hosting workshops on Saturday October 20 and Sunday morning October 21 prior to the start of the 2018 Canadian Association of Pediatric Health Centres Conference in Edmonton (October 21-23). These workshops are open to any interested advisors. There is no cost for the Saturday sessions and a charge of $50 for the Sunday morning sessions. Visit the CAPHC website for information and to register. Volunteer advisors attending the CAPHC conference are eligible for a 50 percent reduction in the conference fees. Email us for further details. 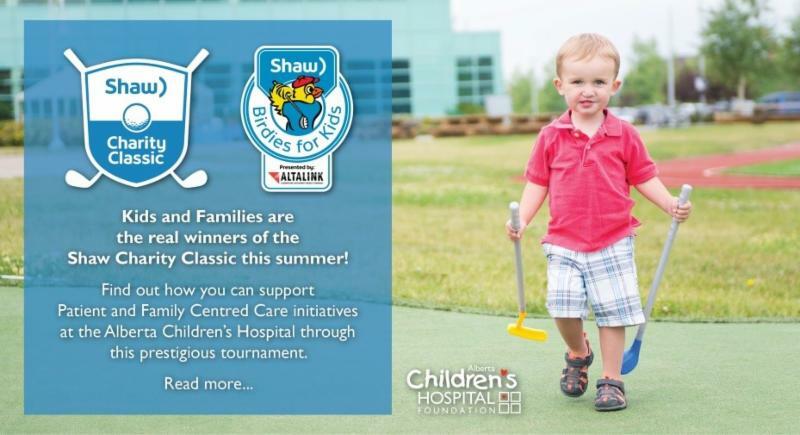 The Alberta Children's Hospital Foundation (ACHF) has been selected by Shaw Communications as an Official Charity Partner of the 2018 Shaw Charity Classic - August 29-September 2.The ACHF is also participating in Shaw Birdies for Kids presented by AltaLink, where all donations will be matched up to 50%. Proceeds from both of these initiatives will support Patient and Family Centred Care at the Alberta Children's Hospital. Attend as a spectator! As an event for the whole family, watch some of golf's most accomplished players. In addition to Juniors activities throughout the tournament, there is a special KidZone with fun activities for little spectators! Click here to purchase tickets and use PROMO CODE:ACHF when prompted. Day passes for ACHF supporters start at just 20$! Kids 17 and under are admitted free with a ticketed adult. Make a donation! Birdies for Kids matches your donation to the ACHF up to 50%! Click here to make your donation and be sure to designate your gift to the Alberta Children's Hospital Foundation. Integration of research and clinical care is highly valued but is often difficult to achieve within the realities of a busy children's hospital. A model for how this can be achieved is provided by theSPORT trial, a CHILD-BRIGHT multicenter study. Presenters - Dr. Adam Kirton, Megan Metzler, and Dr. Alicia Hilderley - are from ACH.